I'm in New York this week for work. 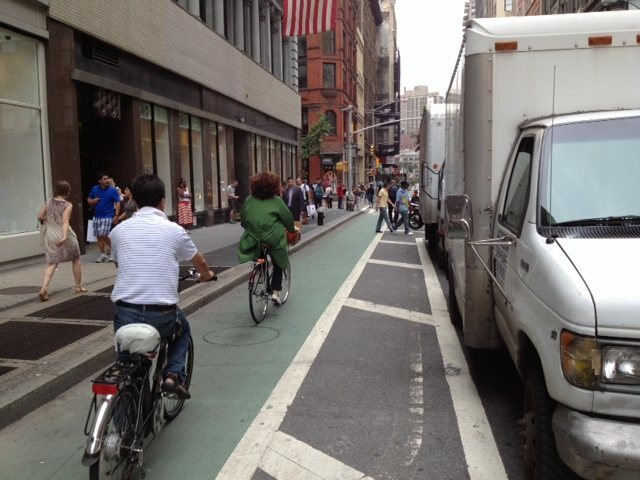 New York is building meaningful bicycling infrastructure everywhere you look. Segregated bike tracks run along many of the avenues and here they're called 'buffered bike lanes'. Rows of parked cars provide the buffer between the moving motor vehicles and the rather more fragile people bicycling in the bike lane. 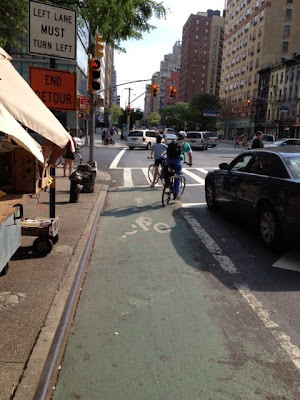 When you get to a junction, the bike lane goes all the way up to the stop light. If you're cycling straight ahead, you get a green light and cars turning into a side street are held on red. In other words, New York is building bike infrastructure that separates the flow of people on bicycles and people in motor vehicles on its very busy avenues. This is the sort of thing London seems to find really hard to do. If you look at most bicycle infrastructure in London, it tends to leaves you to your own devices at junctions. Take Embankment just at the junction between Parliament Square and Westminster Bridge. I took a picture of this brand new re-designed junction last week in the pouring rain. What you can see is that people on bikes are encouraged to thread their way between three lanes of motor traffic up to the junction itself. Then they are meant to sit in on the hatchings between two lanes until the traffic starts moving when they have to dodge the traffic island, getting directly in to conflict with people driving behind them. In my mind, danger is designed into this junction because it is designed solely for motor vehicle use and ignores the fact that people on bikes need to approach the junction differently. It's bad news for people on bikes and it really winds up motorists too. For reasons that are easy to see. This junction is a recipe for conflict. And that conflict is designed into the road layout because the layout ignores the fact that people on bicycles exist. The Department of Transport also seems to think people on bicycles don't exist. In the DfT's submission to the Parliamentary report on road safety published this week, the Department doesn't mention bicycles once. Get that? The number of people being seriously injured on bikes is increasing all over the UK - a 16% increase last year, according to The Times. And in its submission to the cross-party House of Commons review, cycling is not mentioned a single time. I think that's pathetic, frankly. Thankfully, the House of Commons Transport Select Committee seems to think that's not good enough. The MPs note "the first increase in road fatalities since 2003, despite there having been no overall increase in road traffic" and they quite firmly blame government policy. Chillingly, the report concludes: "there does not appear to be a defined action plan to reduce cycle casualties". The MPs criticise a 'lack of leadership' from government on cycling safety and they focus in particular on the need to improve infrastructure so that it is designed for use by people on bikes. @AAPresident Yes; do support AA stance. Time for AA to start talking cycle infrastructure though? "The Netherlands, Denmark and Germany all have large numbers of cyclists. Research suggests that these high numbers result from the provision of separate cycling facilities along heavily travelled roads and at intersections, combined with traffic calming of most residential neighbourhoods." Yup, that's right. But the BMA goes even further. It notes that investment in cycling infrastructure in the UK has been witheringly small and states that "without improved facilities and infrastructure", people aren't going to swap from their cars to bikes. Simple, really. And completely correct. If you want less traffic congestion, if you want people to have healthier lifestyles, if you want to really give people the option to cycle not drive, then you need to ensure the infrastructure works for people on bikes, not just in cars. New York City has worked that out. London is still dithering about it. "If you look at most bicy­cle infra­struc­ture in Lon­don, it tends to leaves you to your own devices at junc­tions. " 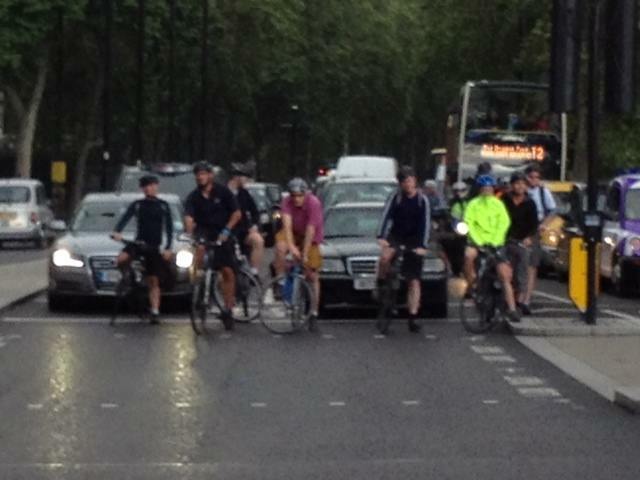 If you look at bicycle infrastructure in the UK it tends to leave cyclists to their own devices at junctions. For each pound spent on cycling infrastructure the country saves more in reduced time lost due to congestion and less health spend. A billion invested now would save several times more over the following years. But... Any health benefits would show up as savings in NHS budget, but the costs would be beancounted in DfT or TfL or such budgets - and derailing the spending away from public transport would be counted as net loss, not to mention loss of popularity if you reduce spending on private motoring. Given that return on investment from cycling is about order of magnitude higher than from private motoring and yet UK repeatedly avoids any significant investment I can only conclude their investment strategy is not rooted on rationality. It's great to see that the voices calling for cycling infrastructure are growing, and from influential quarters, too. I do wonder if the UK government sees mass cycling as a threat to the tax revenue from fuel, though. Increasing modal share for cycling from 2% to 25% means that the government loses out on millions of pounds in petrol tax. The fact that it will save the NHS and police far more money in the long run probably doesn't count as a saving, especially as they're hell-bent on privatising as much of them as possible anyway. It was good to see that the BMA explicitly asserted that the only way to make a step-chenge in cycling uptake is to provide safe and pleasant conditions - infrastructure, or road engineering. So it was a shame that they have not apparently got their neuro trauma surgeons under control, and are still spouting helmet compulsion demands. Advising that wearing a helmet might have safety benefits is one thing - they might just be correct about that - but pushing for compulsion is a sure-fire way to advertise the abnormality and "otherness", not to mention danger, of cycling. And of course while cycling is more dangerous than it should be, all things are relative, and depending on how you measure and compare them - the classic conundrum of statistics - cycling is less dangerous than walking (per mile and per hour) driving (per hour), tennis, football, DIY, gardening etc, none of which currently have helmet compulsion rules. "London is still dithering about it." And not just London, of course. The rest of the U.K. seems to be equally backward, with a very few notable exceptions. "I took a picture of this brand new re-designed junction last week in the pouring rain. What you can see is that people on bikes are encouraged to thread their way between three lanes of motor traffic up to the junction itself. Then they are meant to sit in on the hatchings between two lanes until the traffic starts moving when they have to dodge the traffic island, getting directly in to conflict with people driving behind them." Actually, what you can't see is that there is an advance stop zone for cyclists at this junction. However, as usual it is completely occupied by motor vehicles. A little enforcement of what infrastructure we already have would be nice. Along that aprt of the embankment there are wide mandatory cycle lanes - except that there are often lorries overflowing into them and motorcycles using them to undertake queues of traffic - and many ASZ's - either ignored by cars and lorries, or if they are not, filled up by motorcycles. The level of enforcement of cycle facilities along the embankment is zero. I did a pretty extensive bike tour last year, both in Europe and the U.S., so I got to see a little of everything. Surprisingly (or perhaps not) London was one of the more challenging cities, although other places in the UK were alright.